Mícheál Ó Cléirigh was born some three miles from the present day town of Ballyshannon, then known as Áth Seanaigh, at Kilbarron Castle which was the ancestral hub of the Ó Cléirigh family. They were hereditary chroniclers to the ruling Ó Domnaill of Tír Connaill. He was the fourth son of Donnchadh (son of Uilliam son of Tuathail) Ó Cléirigh and his wife Honora Ultach (Onora Ó hUltacháin). Although the exact date of his birth is not recorded, it is believed to have been sometime after 1590. He was christened Tadhg, possibly after his ancestor Tadhg Cam Ó Cléirigh (d. 1492) who was ollamh to Ó Domhnaill in literature, poetry, and history. As a youth he earned the name “Tadhg an tSleibhe” because of his fondness for hunting and the outdoors. His three brothers were Uillaim, Conaire and Maolmhuire. Because of his background, Mícheál was trained in the scholarly tradition of his family. As a youth Tadhg Ó Cléirigh was sent to study under the Mac Aodhagáin family. Like his older brother Maolmhuire he was probably tutored by M. Ó hEodhusa and James Walters. He became expert in history and as a scribe. Mícheál’s youth was disrupted by the events happening in his surroundings. The Nine Years war, which had been raging off and on since his birth, was drawing to a conclusion. The Franciscan Friary at Donegal was subject to convulsion and attack. In 1601 English forces under Captain Diggis landed at Assaroe, driving out the remaining monks from the abbey and allied with forces of Niall Garbh Ó Domhnaill, cousin of Aodh Ruadh, besieged Ballyshannon castle. The castle which was only lightly defended, surrendered. In 1603 Ruairi Ó Domhnaill (Rory O’Donnell), who succeeded his brother Aodh to the chieftainship, facing encroaching forces from all sides surrendered at Mellifont in Co Louth to Charles Mounjoy, the Lord Deputy. In 1604 Ruairí was confirmed to his title of Earl of Tyrconnell. He accepted that English law would replace Brehon law and agreed to its implementation. The Ó Cléirigh family prospered as long as the politicial power of the Ó Domhnaill clan was ascendant but after 1604 Rory O’Donnell found it difficult to manage his estates with much less resources of income, and no longer had the income from the salmon fisheries on the Erne and he was barred from getting revenue from the port of Sligo. Within his own territory the Earl of Tyrconnell’s position was also threatened by his cousin, Niall Garbh Ó Domhnaill who was embittered that he had not been offered the Earldom by the English. This animosity between both branches of the Ó Donnells continued and was encouraged by the English Sir Arthur Chichester. Previous tributary clans such as the O’Dohertys, Ó’Boyles and the McSweenys were encouraged to break away from their obligations to the O’Donnells and seek freeholds directly from the Crown. This new state of affairs did not rest easy with the former Gaelic Chieftains and they decided to leave Ireland. This event became known as the “Flight of the Earls” and took place in 1607. In the aftermath of the defeat of the Gaelic Irish lords and their Spanish allies at the Battle of Kinsale their land and property were forfeited to the crown. The government begin the process of assessing the lands in the newly demarked counties of Tyrconnell (Donegal), Coleraine, (later to become Londonderry) Tyrone, Armagh, Cavan and Fermanagh with the plan to settle people of English and Scottish stock, known as the Ulster Plantation. On the 12th of September 1609. Lughaidh Ó Cléirigh, Chief of the Ó’Cléirigh clan, a third cousin of Tadhg Ó Cléirigh, was summoned as a juror to the Inquisition at Liffer (Lifford). These Inquisitions were carried out in each of the counties to determine who owned the land and property within the counties selected for plantation. 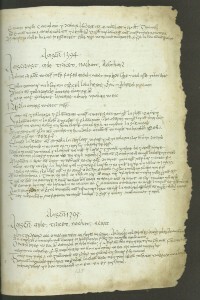 Within Tír Conaill were added the forfeited land belonging to Niall Garbh Ó Domhnaill, who was implicated in the abortive rebellion led by Sir Cahir Ó’Doherty of Inishowen in April 1608 (whose land were directly forfeited to Sir Arthur Chichester) Church and abbey lands were also considered within the inquiry. Kilbarron Parish in the said Barony contains 5 qrs. One of which is herenagh land possessed by the sept of the Cleries as herenagh who pay yearly to the Bishop of Raphoe 13s 4d rent. 6 meathers of butter and 34 of meal, one qr. named Kildonnel (Kildoney?) in possession of the said sept is wholly free from tithes to the bishop, the late abbot of Asheroe was parson and vicar of the said parish in right of his house and received 2/3 of the house in kind, the remainder being payed to the bishop, the church being maintained by both according to the same proportion. Lughaidh Ó Cléirigh, head of the senior branch of the Uí Cléirigh clan was dispossessed of the castle of Kilbarron along with their surrounding hereditary lands. The Ó Cléirigh lands were granted to the Bishop of Raphoe. Sir Henry Ffolliott, Governor of Ballyshannon Castle, was granted the lands belonging to the Cistercian Abbey of Assaroe south of the River Erne in return for maintaining the castles at the Drowes and Ballyshannon at his own cost and maintaining a troop for their defence. The Abbey lands north of the Erne were granted to Sir Francis Grofton, who was a secretary to Sir Arthur Chichester. He later sold his portion to Sir Henry Ffolliott. Trinity Collage was granted The Mac an Bhaird lands of Ballymacaward and the Uí Cléirigh lands of Drumacrin, the latter in the Parish of Inishmacsaint. 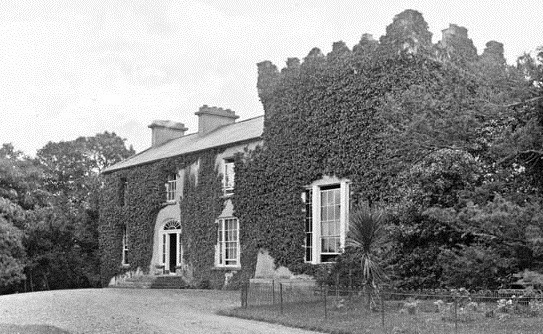 The remainder of the Uí Cléirigh clan living either on the former Abbey Assaroe lands or their ancestral lands had to find an accommodation with the new owners; Sir Henry Ffolliott and the Bishop of Raphoe. (Trinity College land was leased to Sir Henry Ffolliott). They would remain as tenants to the new lords. It must be supposed that like his brother Maolmhuire, his family encouraged or agreed to Mícheál leaving Ireland and going to Spain. There he may have joined one of the Irish regiments which were being formed in various parts of Europe and led by Irish exiles. On the 21st July 1621 the Spanish authorities in Flanders awarded a grant of two crowns to be paid monthly to Don Tadeo Cleri on account of “the persecution and loss of estate he has suffered for the Catholic cause in Ireland” This is believed to be Tadhg Ó Cléirigh. 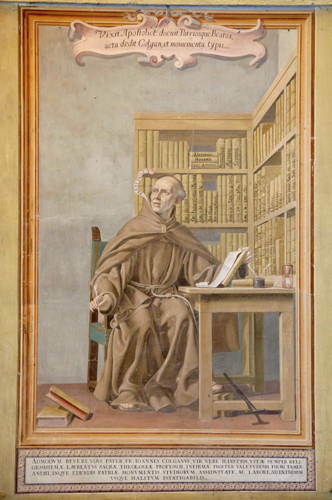 In 1623 Tadhg Ó Cléirigh entered the Franciscan order in Louvain in the Spanish Netherlands. He chose to remain a lay brother although he was sufficiently qualified to take up the study for the priesthood and he took the name Michéal. The Franciscan St Anthony’s College in Louvain was founded in 1607, made possible with money given by the King of Spain, Phillip 11, Archduke Albert, co-ruler of the Spanish Netherlands and others. It was set up with the purpose of training novitiate friars in a safe and secure environment to later return to Ireland to work and preach among the Irish people, to reverse the encroaching influence of the Reformation in Ireland which was gathering pace and traction ever since the defeat of the Gaelic Chieftains at the Battle of Kinsale more than twenty years before. Fr Hugh Ward, (Aodh Buidhe Mac an Bhaird) was made Guardian of Louvain in 1626. He was born in Ballymacaward close to where Brother Michéal grew up. The Mac an Baird family were the hereditary bards to the ruling Ó Domhnaill family and they too had been dispossessed of their lands in the Plantation of Ulster. He had already began working on compiling a list of Irish saints but decided to send Michéal to find source material in Ireland which would allow a fuller account of the of the Irish saints’. He would have been familiar with the scholarly background of Brother Michéal and knew that his family pedigree as historians would gain him access to the valuable book sources that were jealously guarded by the learned families of Ireland. Michéal first went to the Donegal Franciscan friary in the spring of 1627. It was located somewhere close to the River Drowes which formed the boundary between Donegal and Leitrim. The exact location is not known but there is a townland in Co Leitrim called Rossfriar situated on a peninsular jutting into Lough Melvin that would have been isolated. It is likely that this name refers to the monastery’s location. The building would have been unremarkable and may have been merely a cluster of thatched cottages. The friars had located themselves at the Drowes some years after they were expelled from their friary near the harbour close to Donegal Castle in 1601. They had re-established themselves at Drowes with growing numbers and their Guardian was Michéal’s older brother Fr. Bernadine. Later in the autumn of that year Michéal travelled to Leinster, copying material in Dublin, Drogheda and Kildare. In the beginning of 1628 he returned to the Drowes. He spent mid-Summer in Dublin. Later that year he went to Carlow travelling onto Cashel in Co Tipperary. The following year he continues his travels visiting North Tipperary in the early months of the year and Athlone and Multyfarnham in Co Westmeath in the summer, staying in the Franciscan monastery there. His travels continue for the rest of the year but by November he was back at the Drowes where he penned nine works including seven Saints’ lives. The beginning of 1630 he wrote fifteen works at Drowes, mainly the Saints’ lives as well as the Martyrology of Donegal. Towards the end of the year he wrote near Athlone along with his three assistants; Fearfeasa Ó Maoil Conaire, from Ballymulconry Co Roscommon, Cú Coigriche Ó Cléirigh, whose father Diarmaid was a cousin of Lughaidh Uí Cléirigh and Cú Coigriche Ó Duibhgeannáin from Castlefore, Co Leitrim. In December Michéal returned northwards back to the monastery at the Drowes. Lisgoole Abbey -The present house dates from the 17th Century but built on the site of the Abbey. In October 1631 he along with Fearfeasa Ó Maoil Conaire, Cú Coigriche Ó Cléirigh, Cú Coigriche Ó Duibhgeannáin travelled to the Franciscan monastery at Lisgoole in Co Fermanagh to work alongside Giolla Pádraig Ó’Luinin on the “Leabhar Gabhála Éireann” (Book of invasions). The latter was a member of the Ó’Luinin (O’Lunny) family who were hereditary ollamhs to the Mag Uidhir (Maguire) clan of Co Fermanagh. Brian Maguire, Lord Enniskillen, commissioned this work. In May 1635 he wrote “Beatha Mhic Creiche” at Drowes. In November he copied “Cogadh Gaehel re Gallaibh” (Wars of the Gael and the Gall) which chronicalised the wars between the Gaels and the Normans in the Middle Ages. In 1636 after getting Episcopal approbations from Dublin and Kildare he returned to the friary at the Drowes for one last time and began his journey back to Louvain embarking on a ship at Carrickfergus. 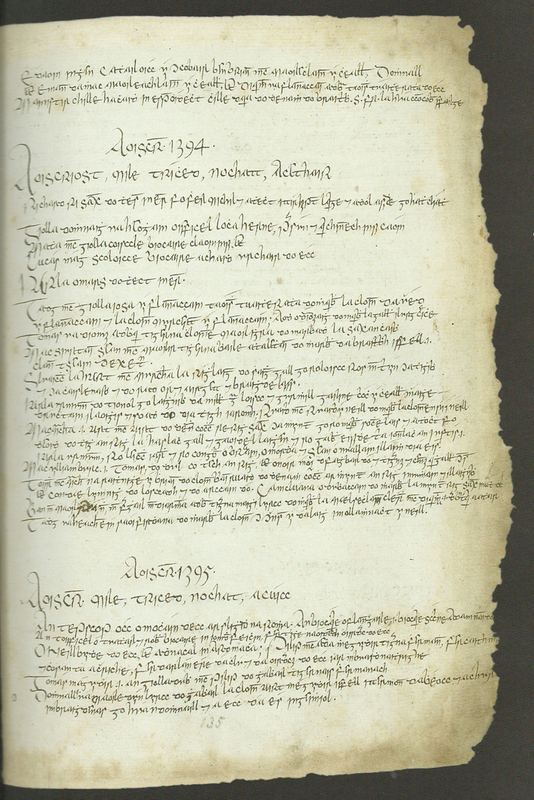 With the work completed the manuscript copy of the annals were given to their patron Fearghal O’Gadhra. The other set was taken to Louvain where the Franciscans planned to publish it. By the time he arrived at Louvain his mentor Fr Hugh Ward was dead having passed away in 1635. In autumn 1643 he published a dictionary called “Foclóir nó sanasán” this is the only work by Michéal Uí Cléirigh to be published during his lifetime. Michéal died in Louvain towards the end of the year. His exact burial place is unknown. “Acta Sanctorum Hiberniae” was published by John Colgan, based on the work of Mícheál Ó Cléirigh. John Colgan was born in Inishowen and who succeeded Fr. Hugh Ward as Guardian of the Friary in Louvain. It contains the lives of two hundred and seventy Irish Saints whose feast days occur in the first quarter of the year. Fr John Colgan died in 1658, it is he who first referred to the “Annals of the Kingdom of Ireland being the work of “quatour magistri” (or Four Masters). The Annals were not printed in Louvain and it was left to John O’Donovan in the 1840’s to edit and translate the annals from Irish to English from the set held in the Royal Irish Academy. The Annals of the Four Masters were published for the first time between 1848 and 1851 in seven volumes. Many of the other works compiled and completed by Michéal Uí Cléirigh and his team of scholars were kept in Louvain until the French Revolution, dispersed afterwards but many returned to Ireland to the Franciscan House in Killiney, Co Dublin. They now form part of the Michéal Uí Cléirigh Institute in UCD, Dublin. Michéal Ó Cléirigh, His Associates and St Anthony’s College, Louvain by Brendan Jennings OFM,Paul Walsh, Felim O’Brien OFM and Canice Mooney OFM.